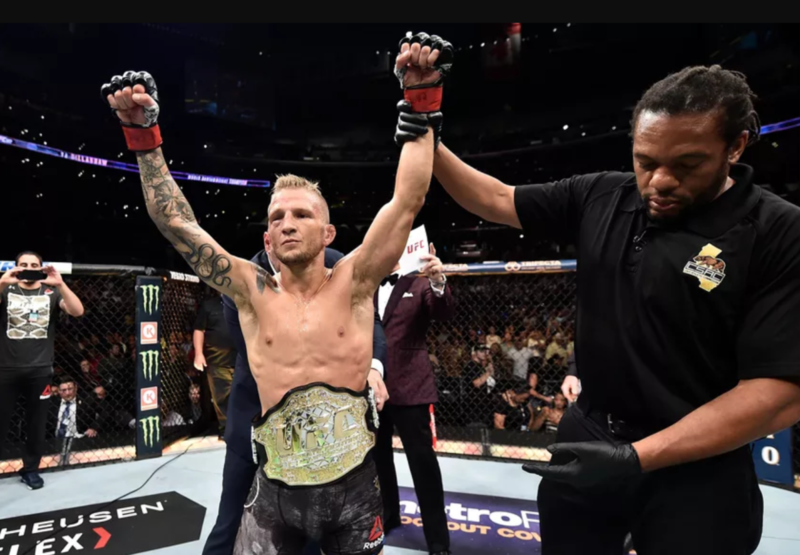 UFC bantamweight champion TJ Dillashaw relinquished his title Wednesday morning due to testing positive for a "prohibited substance" on a New York state athletic commission test. The NYSAC announced a one-year suspension and a $10,000 fine for Dillashaw dating back to January 19th, the night of his loss to UFC flyweight champion Henry Cejudo. Dillashaw announced the news via his Instagram account and said that USADA and the NYSAC informed him about an "adverse finding in a test taken for his last fight". He didn't say what the substance was or admit to taking it, but said he was going to work with his team to figure out what happened. As of this writing, USADA has yet to release a statement but this post will be updated when they do. This would open the door for top contender Marlon Moraes to get an opportunity to fight for the bantamweight title, likely against Cejudo who was all but guaranteed to get the opportunity after his quick knockout win over Dillashaw that set up the rematch at the higher weight class. Looking ahead, there are several events without a main event at this time with the earliest being UFC on ESPN+ on May 18th.